Timber suppliers in Brisbane reveal the surprising numbers for timber compared to steel, concrete and aluminium. eye-opening information on his blog about the sustainability of timber compared to the three other most popular building materials. In particular, Mr Kyle focused on the carbon footprint or the amount of carbon that is released into the environment by the various materials. Carbon is present in CO2, a “greenhouse gas” that contributes to climate change. By the process of photosynthesis, trees use sunlight to help them take CO2 out of the air. The carbon in the CO2 is stored or “sequestered” in the tree as woody tissue, by a process called “sequestration.” Meanwhile, the oxygen in the CO2 is released back into the environment, making our air more oxygen-rich. Every piece of timber is basically made of this stored carbon, which is preserved and kept in the timber. The only way the carbon in timber is ever released back into the environment is when the timber either decays or is burned. To produce timber, take it to market and take it to a building site, fossil fuels are used, but it doesn’t take a lot because the timber is natural. For standard timber, there is no manufacturing process. Fossil fuels are used only to provide power for cutting the timber and fuel for transporting the timber from the forest to its eventual destination, with various stops along the way. Other materials, such as steel, aluminium and cement, have to be manufactured. In the case of steel and aluminium, a lot of heat is necessary to produce the desired chemical reactions. In addition, these materials are heavier than timber, so more fuel is used in transporting them to their destination. 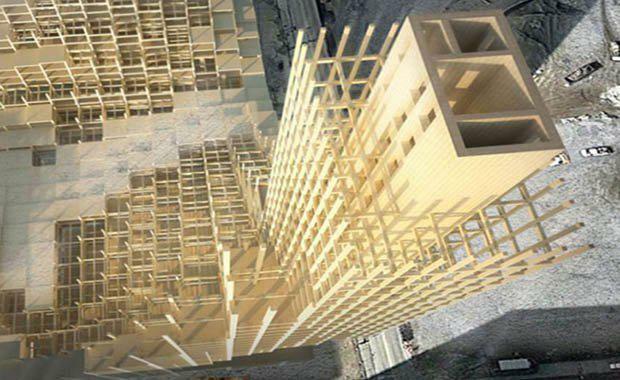 For each cubic metre (m3) of timber, the amount of carbon released into the environment is 15 kilograms. However, the timber stores 250 kilograms of carbon, meaning that the net effect is that 235 kilograms of carbon is removed from the environment for every cubic metre of timber. For each cubic metre of concrete, 120 kilograms of carbon is released. For each cubic metre of steel, 5,320 kilograms of carbon is released. For each cubic metre of aluminium, 22,000 kilograms of carbon is released.